The leaves of books in the Middle Ages were made of parchment and vellum, created from animal skins in an expensive and time-consuming craft. It was so costly that scribes often recycled pages from earlier books, removing the ink to create a blank sheet. In the early Middle Ages, the ink was washed off and over time the shadow of former writing reappeared like a pentimento in a painting. In the later Middle Ages, they used pumice powder to scrape the ink away for good. Volumes with the ghostly memories of previous texts still impressed in the pages are called palimpsests and researchers have been trying to read the vanished writing for centuries, either by careful sight-reading of whatever could be discerned or, starting in the 18th century, by the use of chemicals like tincture of gall which is high in tannic acid and badly damages the manuscript. Nowadays we have new options courtesy of spectral imaging technology. Researchers Gunther Martin of the University of Bern and Jana Grusková of Comenius University in Bratislava enlisted the aid of Los Angeles-based organization the Early Manuscripts Electronic Library (EMEL) to examine a palimpsest in the Austrian National Library in Vienna using brand new multi-spectral technology. The text in question is the Codex Vindobonensis historicus gr. 73. The bound collection of 10th century ecclesiastical ordinances was acquired in the 16th century by Ogier de Busbecq, Holy Roman Emperor Ferdinand I’s envoy to Constantinople, an avid manuscript collector who would bequeath his collection to the imperial library in Vienna. The parchment pages of the codex came from two different 11th century manuscripts, with 11 pages of monastic rules and prayers added in the 13th century. 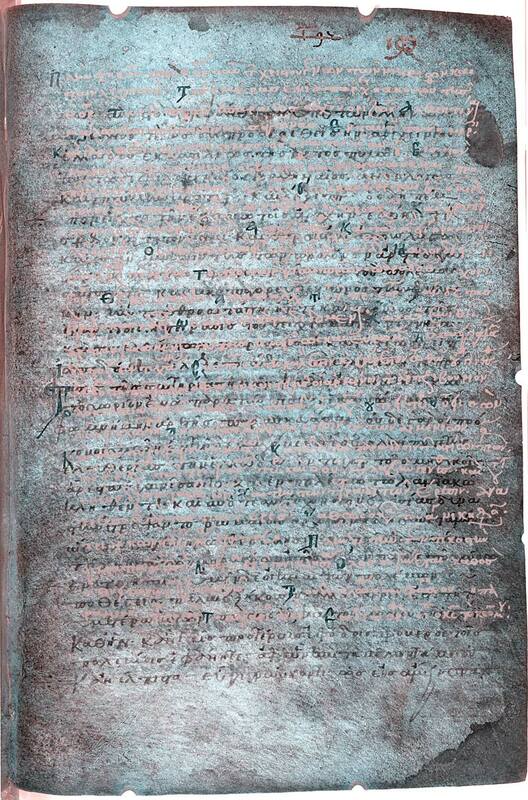 The presence of hidden text in the Codex Vindobonensis was discovered decades ago, but even under UV light the text was too faint to be read accurately. A few years ago the Austrian Science Fund (FWF) funded Martin and Grusková’s research into palimpsests, allowing them to look behind the visible script of the codex with EMEL’s multi-spectral technology. The pages were irradiated with lights of different wavelengths. Each type of light is absorbed into the parchment and ink to different degrees. Photographs capture the degrees of absorption and then computer software stitches the pictures together to create a detailed image of the hidden text. With this system, Martin and Grusková were able to read pieces of the ancient Greek text underwriting the medieval and discovered a precious treasure: significant sections of a history of Rome’s 3rd century Gothic wars written by 3rd century Athenian historian P. Herennius Dexippus. His history, the Scythica (Dexippus called the Goths Scythians), was only known from very fragmentary quotes in much later books. These hefty passages shed a whole new light on the wars of the mid-3rd century. Martin and Grusková published several of the passages into German in 2014. Now Oxford University’s Christopher Mallan and the University of Queensland’s Caillan Davenport have translated one of the fragments into English. It’s a splendid description of a battle at Thermopylae, probably the most famous battle site of the ancient world where in 480 B.C. King Leonidas’ 300 Spartan warriors and other Greek forces took their brave last stand against the far larger army of Persian King Xerxes. I find it a tremendous bummer when news stories about this kind of discovery do not include the full text, even when it’s a bit dry or appeals only to the nerdiest history nerds, and in this case the lack of the complete quote in the press accounts is unforgivable because it’s pure awesome. All killer, no filler. It’s the content and style of the writing that identifies it as the work of Dexippus. The Scythica was known to include several siege narratives and long speeches (likely fictionalized) by military leaders. The details about the engagement at Thermopylae — the geography of the site, the weapons of the militia, the names and origins of the generals — indicate this passage was part of a far larger narrative history of the period. No other history written in Greek during the 3rd century goes into such detail about events in the reign of the emperor Gallienus. Only Scythica fits the bill. There are other characteristics that mark it as Dexippus’ history. The author uses no Roman terms, titles or Latinisms. The focus is on regional figures — Dexippus the Boeotian and Philostratus the Athenian — working in tandem with Roman authorities — Marianus — and on the valor and achievements of Greeks. Even the Roman general makes a point of admiring the history of Greeks’ fight for freedom. On these points Mallan and Davenport agree with Martin and Grusková, but there are significant areas of disagreement as well. For example, Martin and Grusková believe this battle happened during the Herulian invasions (267/8 A.D.), when the barbarian invaders defeated the Greeks at Thermopylae, but Mallan and Davenport make a strong case, in my opinion, for the battle taking place during an earlier Gothic invasion in around 262 A.D. The Herulian invasions were predominantly seaborne, but there’s no mention of naval engagements in any of the newly discovered fragments, nor do any other sources on the Herulian invasions mention a battle at Thermopylae, which, given its iconic status, is an unlikely oversight. Also Thessaloniki was successfully besieged by the Heruli. This passage describes the Thessalonian defenders as victorious. Another area of disagreement is the identity of the Roman general Marianus. Martin and Grusková identify him as dux Aurelius Marcianus, one of Gallienus’ generals who fought against the Goths in the late 260s and conspired to kill the emperor in 268. Mallan and Davenport posit that he is a previously unknown general named Marianus, a senator and proconsul of the Roman province of Achaia. (In keeping with his rejection of Latinisms, Dexippus’ reference to Achaia is a geographical region of Greece, not the Roman province. The Greeks called the Roman province “Greece inside the Gates.”) Since proconsuls had limited garrisons at their immediate disposal, he would have had to turn to local militias to help defend the pass. The reference to the generals being “elected” suggests the defensive forces were assembled by a Greek political body, probably the Panhellenion which was the only body in the 3rd century that covered the regions of Greece represented by the three generals: Boeotia (Dexippus), Athens (Philostratus) and Marianus (Achaia). No other sources mention the Panhellenion appointing military leaders, but the invasion was an extraordinary circumstance which required a speedy military response. Mallan and Davenport therefore propose a new reconstruction of the Gothic invasion of the early 260s. In late 261 or early 262, the Goths invaded Greece and laid waste to the provinces of Thrace and Macedonia. They besieged Thessaloniki, but it was ably defended by the residents so they moved on to the Roman province of Achaia. The Greeks, likely through the Panhellenion, quickly organized a defense of the province under three generals with Marianus, Roman proconsul of Achaia, at the lead. The Goths invaded Achaia by late 262, early 263, but were turned back by Marianus and Greek militia at the pass of Thermopylae. They didn’t leave empty-handed. On their way out they sacked the rich temples and sanctuaries of Greece before moving on to the Roman Asia province at the end of 263. The threat to Greece was over (for a few years). This entry was posted on Monday, March 28th, 2016 at 11:00 PM	and is filed under Ancient, Medieval, Modern(ish). You can follow any responses to this entry through the RSS 2.0 feed. You can skip to the end and leave a response. Pinging is currently not allowed. Me too. So often palimpsest finds are small things. This one is so long and meaty. I must admit that for decades I’d known the word as “palimpest”: it was only twenty years ago that I learnt about the other “s”. Repeat after me: palimpsest, palimpsest , palimpsest. Hey, for my entire childhood and teenagerhood I thought it was Thermo-PLY-ae. It wasn’t until I took a proper ancient history course in college that someone said the word out loud and I realized I’d been flipping letters and emphasizing the wrong syllable my whole life. Och, Dearieme, my error was greater. I knew the word, and how to spell it, but had never troubled to look it up to learn the meaning. Mea culpa. I’m just as erring, for some reason I thought a palimpsest was two different written texts on one page. One line belonging to one text and the next to a separate text, a sort of literary puzzle. When in fact it is one text written over another hidden text. Thank you livius drusus, I always learn something new from my visits here. On many palimpsests the page rotated 90 degrees to minimize interference between the remnants of the original text and the new. These are known as an “interpolated palimpsest” which is a good phrase to drop into your conversation on a regular basis or for folk who do the London or New York Times crossword puzzles in ink. Maybe Trajan’s lost account of the Dacian campaigns – or substantial parts of it – will be similarly recovered. Any piece of ancient Greco-Roman literature brought back to life is a victory for History. The description of the battle is not the first battle of Themopylae between the Greeks and Persians. It is the later battle from 279 B.C. during the Celtic (named Goths in the manuscript) invasion of Greece. Obviously it’s not the famous battle of Thermopylae between the Greek and Persians, hence the use of the word “another” in the title and well as the detailed exploration of the subject in the body of the article. Where do you get the 279 B.C. date from? The scholarly debate I’ve read is between the 267/8 (not 279) A.D. Herulian invasion or an earlier one from around 262 A.D. The Scythica is a 3rd century history and even if it the scholarship is wrong and it’s not a passage from that book, certainly Romans would not be involved in a battle in Greece as early as 279 B.C.